FDA Blanc AA- A white food conveyor belts grade rubber with a tensile strength of between 250N/mm and 1600N/mm with 2 to 4 plies. It is anti abrasive. FDA Blanc AA would be suitable for use with cereal, malt and salt. FDA Blanc G- A white food grade rubber conveyor belt with a tensile strength of between 250N/mm and 1600N/mm with 2 to 4 plies. FDA Blanc G is oil and fat resistant. 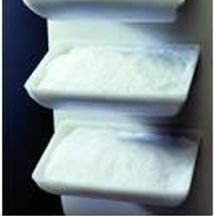 It complies with international standards for antistatic ISO 284 and is suitable for transporting products such as rice. FDA Blanc GS- A white food grade rubber conveyor belt with a tensile strength of between 250N/mm and 1600N/mm with 2 to 4 plies. FDA Blanc GS is oil and fat resistant , suitable for ATEX zones 20-21-22 and is a certified flame resistant belt in compliance with international ISO 340 standards. It is suitable for transporting dry or moist refined sugar. White conveyor or elevator belts for general use. Blanc - A white multi-ply white rubber belt for general use where there is no security or sanitary concern, such as conveying washing powder. It has a tensile strength of between 250N/mm and 1600N/mm with 2 to 4 plies. With a temperature range of -30 degrees c to +100 degrees c.